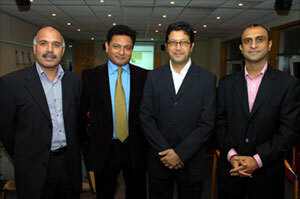 TOP figures from the sporting world spoke to members of the Woking Asian Business Forum (WABF). Shahid Azeem, chairman of the WABF, welcomed Indy Lall, test team manager for McLaren in Woking, as the star guest for the meeting at Hollywood House on Monday. Mr Lall, who has worked for McLaren for 30 years, talked about starting out in the industry as a teenager and meeting McLaren boss Ron Dennis, who offered him the job of gofer at McLaren. Pervez Jamil (PJ) Mir, the media manager for the Pakistan team during the cricket World Cup in 2007, made a special appearance at the meeting. He spoke about the moment he found Pakistan cricket coach Bob Woolmer lying dead on his hotel room floor. Mr Mir revealed matters that had not been discussed in the media reporting of Mr Woolmer’s death. He said: “His mouth was open and I said we have got to get him oxygen. Mohammed Zubair, the owner of Galaxy Cars taxi company in Woking, also spoke about how he built his successful business. Karen Porter, marketing communications manager for Woking Borough Council, appealed to businesses to sponsor the Tour Series, a one-day professional cycling event that will come to Woking in June next year. © 2014 - Woking Asian Business Forum, All Rights Reserved.